A south swell has been running for several days with the wind blowing briskly out of the north. It is Friday morning and I am looking forward to scuba diving with the Hammerhead Shark. The dive site for today is about an hour from Lahaina Harbor across the Pailolo Channel and on the northeastern end of Molokai. This dive will take approximately five hours from the time we leave the harbor until our return. few of the divers on board have done this dive, including myself, many times. However, for most on board this will be their fist dive on Molokai and the first time with Hammerhead sharks. The boat heads toward the dive site, staying close to the western shore of Maui, until we are almost directly across from the dive site. The boat then makes a sharp turn to cross the channel. The seas are running four to six feet with an occasional swell in excess of eight feet. Some first timers on the boat get a bit nervous. It takes about 25 to 30 minutes to cross over to Molokai and by that time a couple of divers on the boat that are sea sick. This channel is one of the roughest in the Hawaiian islands. Its name literally means “crazy fishermen”. Because if someone was going to go fishing across this channel they must be crazy. The captain of the boat gives us a 10 minute warning telling us it is time to put on our gear and get ready to enter the water. We put on our wet suits, BC’s, and fins while sitting in assigned stations on the boat. The water is rough so we wait on the crew to help us stand up and move into position at the back of the boat. But, we don’t enter yet. We wait for the captain to move the boat into position and give us the signal to enter the water. The crew tells us “1 minute”, “30 seconds”, “captain divers are ready”, then we wait for the captain. The back of the boat swings round toward the islet, then the captain yells “dive, dive, dive”. Our group jumps almost in unison and we are all in the water within 15 seconds. The surface is choppy and after making sure all divers are OK, we rapidly begin our descent. The water is light to medium blue for the first thirty to forty feet with rays of sunlight filtering around us. Then the water begins to slowly darken as we descend on the dive site know as Fish Rain. The reef is on our right and blue water is to the left. The bottom slopes gently downward from about 40 feet to around 120 feet. 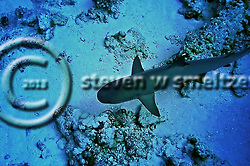 While I love the reef, I constantly look into the blue, hoping to see a Scalloped Hammerhead Shark. Fish Rain is located on Mokuhooniki Rock and is one of the most bio-diverse dive sites on the planet. The density of marine species, the health of the corals and the presence of pelagics make this a must dive. But, again we have come to see the Hammerhead Shark. The dive starts out in the lee of the islet which is somewhat protected from the crazy waters of the Pailolo Channel. While this site can on rare occasion be like glass, it most often has swells of 2 to 4 feet and can grow on occasion to well over 6 feet. This is not a dive for the novice diver. This is an advanced dive and anyone thinking about going should carefully consider their level of experience and confidence. You enter the water quickly from a moving boat a quickly descend to around 50 feet. After your dive group assembles you will slowly make you way around the Islet in an arc. The dive is a drift dive and can be one of the most difficult dives you will every make due to the entry into and exit from the water. Again this dive is not for the novice, but oh what a dive. I have been on this site dozens and dozens of times yet it never ceases to amaze me. The Scalloped Hammerhead Shark in Hawaii has been known to reach lengths of up to 13 feet however 6-8 feet is typically the average. Near Mokuhooniki Rock, the Scalloped Hammerheads tend to be adults of 6 to 8 feet with the occasional shark measuring well over 10 feet. These sharks can be found from very near the surface to about 130 ft. We see them very often cruising just off the bottom of the channel between Molokai and Mokuhooniki Rock, where the depths run typically 100 to 130 feet. We will see them in groups of 1 to 3 but many times you can see groups of 5 to 10 and occasionally many more. On my best dive here I have just under 50 Scalloped Hammerheads and have been literally surrounded as I am taking photographs. If the sharks are moving away from your group keep swimming toward them and keep looking all around. There are more than likely other sharks near by. When the sharks are getting close to you stay still and let them swim to you. I was getting ready for a wonderful encounter with a 12+foot female Scalloped Hammerhead Shark when a person in our dive group start swimming rapidly down towards the shark to get their “go-pro” shot. The shark simply turned away and the diver probably did not get a good shot and the rest of the dive group was denied the experience of interacting with a large hammerhead. As I have said before, if not my very favorite, definitely in my top five. This site has an amazing reef, tremendous bio-diversity, a very healthy reef system, does not see many divers and it has ….. Scalloped Hammerhead Sharks. If you are an advanced diver, this site is definitely for you. Maholo nui loa and safe diving. Knob Hill is an interesting and very nice dive site. It is fairly shallow about 55 to 60 feet (16 to 18 meters) and teeming with life. However, it is often not possible to dive on this site due to strong currents . The dive site is just off the coast of Lanai by the Four Seasons Hotel. The name comes from a large rock formation near the surface that is supported by four columns. This is a large dive site on the south side of Lanai that is quite exposed. I have been diving around Lanai for over 12 years and have been on this site maybe three or four times. The only reason this site is not rated higher, is the current makes it a very difficult dive site to dive 80% of the time. If the current is mild this is an awesome site. Knob Hill has a number of swim throughs and volcanic structures, such as the “table” above that make the site quite interesting. The marine life on the site is varied and abundant. You will almost always find large schools of Pennant Butterflyfishes along with a wide variety of other Butterflyfishes, Dascyllus, Yellow Tangs, Sea Turtles, White-tip Reef Sharks, various eels and much more. Once the boat is on the mooring at Knob Hill, the dive master make take you on several different routes around this expansive dive site. The hard coral here is quite healthy due to the current and infrequent visits by divers. 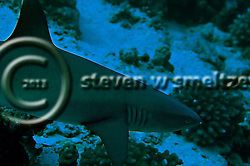 There is a nice swim through / cave where you can frequently find White-tip Reef Sharks. You can also see quite a few nudibranchs on this site and rare species such as the endemic Yellow-striped Coris and Reticulated Butterflyfish. 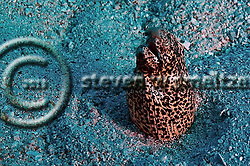 Visit my blog page Hawaiian Dive Site Reviews, to view reviews of other great dives in Hawaii. 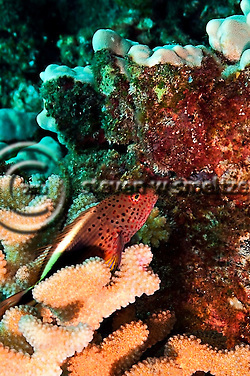 Visit my website for other underwater photographs and/or follow me on Twitter. Scuba Diving Molokai can be awesome, especially at Mokuhooniki Rock. The reef here is one of the most interesting that I have dove on anywhere on the planet. The variety of marine species, the isolation and the relatively untouched environment make this a one of a kind location. But……we all come for the Hammerheads. Mokuhooniki Rock or islet is located at 21 07′ 40″N, 156 42’20″W just off the North eastern coast of the island of Molokai. This dive site, also known as Fish Rain, is one of my top ten scuba diving sites in the world. Interacting with such a variety of marine life combined with the opportunity to spend time with large pelagic species makes this a special place. When scuba diving Molokai Mokuhooniki Rock, you encounter Hammerhead sharks on almost every dive. You will also see a rich and diverse ecosystem containing large schools of Damsels and Butterflyfish to Dolphins, to Tiger Sharks and much much more. You will be hard pressed to find other dive sites that have the abundance and variety of marine life in such a pristine condition. If you are on Maui and you are an advanced diver, you simply must do this dive. This site can be adventure diving at its peak. It takes about 45 minutes to an hour to go from the harbor in Lahaina to Mokuhooniiki Rock. Crossing the Pailolo (means crazy fishermen) channel alone can bring seasoned divers to their knees. It can be quite rough. This is not a beginners dive site. In fact even if you are an advanced rated diver, you should be extremely comfortable exiting a moving boat and reentering a moving boat in potentially rough and choppy seas. I have been on this site dozens of times and while it can be like glass, it is extremely rare. The site can also have 6+ foot waves. I have seen divers break ribs on their reentry and others become extremely agitated and near panic on the pick up. I remember one dive in particular where the waves, even in the lee of the rock, were running about 8 to 10 feet. As the boat came around to pick us up I was literally on the top of one wave looking down at the captain of the boat who was on the top deck of a double deck dive boat. The boat was some 5 feet or so below me in the trough of a wave. I was thinking this is going to be a very interesting pickup. But……what a great scuba diving site. crew will let you know about ten minutes before it is time to enter the water. They will begin lining you up at the back of the boat one at a time. You will have your mask and fins on, BC inflated and be holding anything you want to take into the water with you, including cameras. If you have not entered a dive site from a moving boat before this will a bit of an adventure for you. Think of it as channeling your inner Navy Seal. When you are lined up at the back of the boat, the captain will swing the boat around toward the islet and when all divers are ready, the crew will say Divers Ready. They will then begin counting down two minutes, one minute, etc. Then when the Captain gives his ok the crew will give you a signal “Dive, Dive, Dive”. Do NOT enter the water before the crew has given you the OK, and said “Dive, Dive, Dive”. The divers will quickly enter the water one after the other as the boat is moving. Typically up to 8 divers may enter in 15 to 20 seconds. You will then meet you dive guide on the surface and all begin your descent together. You are usually on the surface no more than 30 seconds before beginning your descent. depth is about 100 to 110 feet in the channel but only about 50 to 60 where you will be dropped off. The visibility is usually very good allowing you to see 100 to 150+ feet in the distance. There are fish everywhere. The dive itself is basically a half-circle around Mokuhooniiki Rock and the boat will pick you up on the other side. Dive time is usually about 50 minutes give or take depending on depth of the dive and your air consumption. If you dive Nitrox, this is a great spot to use it as you can get a little more time at depth when looking for the Hammerheads. I usually hang out to the left of the group as I don’t want to have a lot of other divers close to me when I am trying to get a shot. The Hammerheads sharks are a bit skittish. If you or someone in your group swims rapidly towards them, they will simply move away. The key is to go slow and easy and be patient. As you start your descent from the boat you will follow the slope down to around 50 feet and then do one of two things. Either start swimming out into the blue and looking for the sharks, which we do many times on the first dive, or you will begin to swim around the islet. There can be a bit of current here but usually it is not too bad. Or if there is a ripping current it is usually going the direction of the dive once you pass the corner of the islet and it simply becomes a drift dive. When Scuba Diving Molokai, you can see anything from dolphin, to Tiger Sharks (not often), to Greys, to Hammerheads, to a Monk seal. You may also encounter a variety of rays and there have even been a few rare Humpback Whale sightings while on the dive (December to April). The abundance of various fishes and eels will blow you away. There are also many endemic species on this site so be attentive and take your time. When you surface you will stay with your dive group until the boat comes to get you. You will need a safety sausage to go on this dive and at least one of you will inflate the sausage at the end of the dive to signal the boat. If it is rough it is very important to stay as close together as possible while you are waiting to be picked up. Their could be one or max two other groups in the water, so you may have to wait several minutes to be picked up. Again be patient. The boat will come very close to you and throw a line out to the divers. You have to swim to the line and grab a hold and then begin to slowly move up the line towards the boat. You will take off your fins while you are holding on the line and have those in one hand to give to one of the crew as they help you aboard. If you have a camera as I do, then you will give them your camera first to the crew and then take off your fins. Then you will proceed towards the boat and use a ladder to board. This can be quite intimidating if you have never done something like this, but the crew is exceptionally good at what they do. Listen to them and do as they say and you will be fine. Believe me this dive will be worth it. After you finish your first dive and complete your surface interval, you will basically repeat the same dive on your second dive. But there is enough on this dive site to interest you no matter how many times you dive it. After scuba diving Molokai you get to relax on the boat ride back to Lahaina and enjoy the other adventures that Maui has to offer. Many words can be used to describe the Scalloped Hammerhead Shark. This apex hunter cruses about coastal warm temperate and tropical seas in the Atlantic, Pacific, and Indian Oceans between 46°N and 36°S from the surface to depths of 1,000 meters. It may enter estuaries or be found in the open ocean, in large groups in the Galapagos, Malpelo, Cocos and Revillagigedo Islands and within the Gulf of California. In Hawaii, on the island of Molokai, you can find groups of up to 60 or 70 sharks. However, at Molokai you are more likely to see solitary individuals or perhaps small groups of 4 to 10 sharks. In March, I was diving with Lahaina Divers on Molokai and had one of the best shark dives ever, interacting with almost 40 sharks over the course of two dives. This dive site, off of Moku Ho’oniki rock on Molokai, is one of my favorite dive sites anywhere in the world. I have made dozens of dives on this site and while I thoroughly recommend it, it is not for the average recreational diver. While on many occasions this site can be reasonably calm (I have seen it where the surface is almost glass) it is one of the most unpredictable dive sites that I know. In fact, I have been waiting to get picked up by the dive boat, at this site, when I am literally looking down on the boat (a two decker by the way) from the top of a wave. The seas here can reach 10 feet in height or more and requires the diver to be experienced, confident, under control and above all willing to adhere to instructions given by the dive master and boat captain. If you are a novice diver, do not attempt to do this dive. I have seen inexperienced divers, break ribs and have extreme difficulty reentering the dive boat. So again, this is not a dive site recommended for anyone other than an advanced diver that has previous experience exiting and entering a dive boat while it is moving. However, this is an awesome dive site. The drop off location is called Fish Rain, and has a depth of 30 to 40 feet at the entry point and as you descend and look up you will think it is literally raining fish. 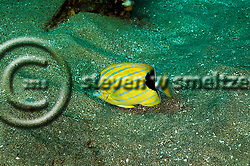 They are everywhere, the Hawaiian Dascyllus, all kinds of Butterflyfish, Angelfish, Moorish Idols, and many, many more. Dozens of individuals to large schools of schools of many types of fish inhabit this very unique environment. The site is to a depth of about 120 feet. The sharks can be found anywhere from a few feet from the surface to cruising about along the bottom. The site can have severe current, that can cause the inexperienced diver to rapidly consume their air supply. So again, this site is not for inexperienced divers. When interacting with any shark, the key is patience. The Hammerhead shark in particular, is a fairly shy species and if you swim rapidly toward the shark you will more than likely not see much more than a brief glimpse. I have been on this site several times when an over anxious diver swims rapidly after every shadow they see and the rest of the divers do not see any sharks at all. However, if you are patient and slow in your approach you may be rewarded with a wonderful encounter. On this particular dive, we entered at Fish Rain, in the “shadow” of Moku Ho’oniki that provides a fairly calm spot to exit the dive boat. As we descend I tend to stay on the outside shoulder of the dive master and about 30 to 50 feet from the nearest diver in the group. I am constantly looking out and down, hunting for the elusive Hammerhead. In the distance is see several shadows coming in towards me at about 80 feet. I was hovering around 45 feet and dropped down slowly to “intercept” the group. As I was waiting for the group to get in range I looked back to my outside shoulder away from the rest of the divers and got a wonderful shot of this solitary shark coming in to check me out. I can tell this is going to be a wonderful dive. This particular individual swam with me at a distance of 10 to 15 feet from me for about 2 minutes and then gradually disappeared in the distance. I move quickly back up to about 50 feet to conserve my bottom time feeling awesome. We continued to drift with the current, which was really moving at this point, spotting several groups of 3 to 4 individuals and one group of eight sharks. I about 35 minutes into the dive, I saw another individual at about 100 feet and quickly dropped down to see if I could get some interesting shots. 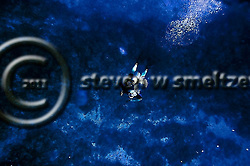 The black and white image above is of this shark at about 120 feet and while I was descending through about 100 feet. As I dropped down I kept checking around me and saw that four other individuals had now come fairly close to me from behind. I was able to get a nice shot of the “school” and when I turned back the other way there were six shots directly in front of me and a couple about 10 feet above me. Yahoo, what an awesome experience to encounter these marvelous creatures. I slowly started to ascend, to keep my computer out of deco, and watched as each of these groups faded slowly in the distance. During our two dives we counted well over 50 individual sights and estimate that we saw at least 35 individuals. It was an awesome dive and keeps me wanting to go back for more.